Flash Fighters is a new, all natural product that is indicated for the relief of many symptoms that are often associated with the onset of menopause. These menopausal discomforts can really impair or inhibit the way you live your life, so it is important that any supplement claiming to provide relief from those symptoms be thoroughly researched. Luckily, we have decided to do that for you. 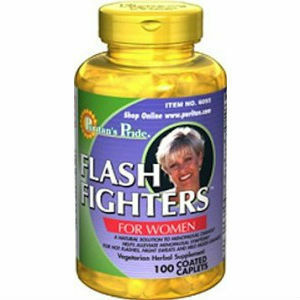 Flash Fighters claims to be able to relieve Hot Flashes and Moodiness. Soy Isoflavones– Soy is commonly used to treat some of the symptoms women experience with menopause. Calcium- Calcium can help reduce PMS symptoms. Black Cohosh Extract- Black Cohosh Extract has been used to treat some menopause symptoms. Dong Quai- Dong Quai has shown little evidence in proving its effectiveness with treating menopausal symptoms. Licorice- Licorice has nothing to do with treating menopause symptoms. The recommended dosage for Flash Fighters is 3 caplets each day with a full glass and a meal. One bottle of Flash Fighters costs $24.99. However, if you buy 3 bottles, the cost is only $37.47, meaning you save 50% if you buy 3 bottles of Flash Fighters. Flash Fighters comes with a year long guarantee. This guarantee says that is you are not satisfied with Flash Fighters, simply return the unused portion, with an explanation of why you are returning it, and they will refund it. Flash Fighters uses only one ingredient known to effectively reduce or relieve the effects of menopausal symptoms. Some of their ingredients do not have any indication from medical professionals at all for such uses. Flash Fighters, while containing ingredients that could benefit one’s health, is not a proper alternative. Jackie Horowitz	reviewed Flash Fighters By Puritan's Pride	on May 4th	 and gave it a rating of 2.5.